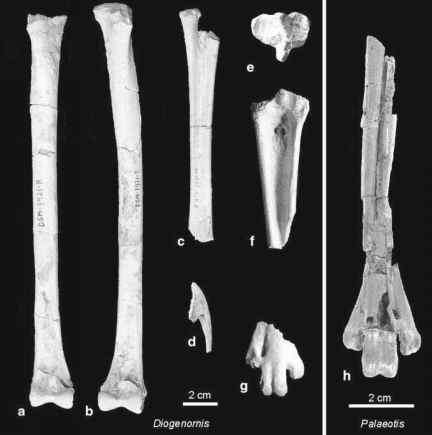 The Remiornithidae are a further group of Paleogene Northern Hemisphere palaeognathous birds. 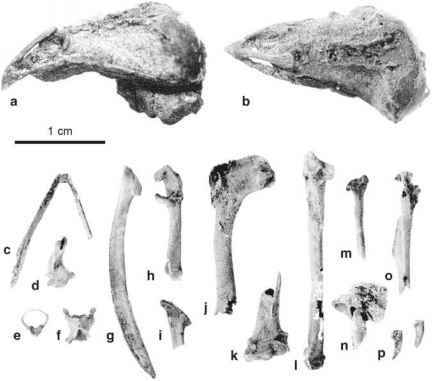 The single species included in the taxon Remiornis heberti Lemoine, 1881 is represented by leg bones (tibiotarsus and tarsometatarsus) and a few associated remains from the late Paleocene of France (Martin 1992). The tarsometatarsus is about the length of that of Palaeotis weigelti but is much stouter, indicating a significantly larger overall size of Remiornis heberti. The tibiotarsus lacks an ossified supratendinal bridge. As in Palaeotis the tarsometatarsus exhibits a marked furrow along its dorsal surface. Except for the more deflected trochlea for the second toe, the bone also resembles the tarsometatarsus of Palaeotis in the configuration of the distal trochleae (compare Fig. 8 in Martin 1992 and Fig. 1 in Mayr 2002). I thus consider it not unlikely that future specimens will support a clade including Remiornis and Palaeotis, for which the name Palaeotididae would have taxonomic priority.